Recently, the Chicago Athenaeum Museum of Architecture and Design presented its Good DesignTM Award for 2017 to John Deere, for its 9RX Series Tractors. Each year, the museum presents these awards to the most innovative and cutting-edge industrial, product and graphic designs from around the world. “The Good Design Award is the result of the extraordinary dedication and talents put forth by our team of engineers and designers of the powerful, efficient and smart 9RX Series Tractors,” said Janet Willett, engineering manager for 9RX Series Tractors. A jury of design professionals, leading industry specialists and media judged and evaluated entries based on criteria established 70 years ago. The criteria considered for the industrial category included: innovative design, new technologies, form, materials, construction, concept, function, utility, energy efficiency and environmental sensitivity. 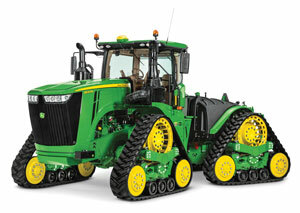 Deere offers multiple 9RX Series Tractor configurations, ranging from 470 to 620 engine horsepower. 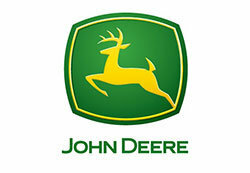 “Our team of engineers worked diligently to deliver the reliable tractor John Deere is known for, and that ultimately helps our customers farm more productively,” Willett stated. For validation, multiple 9RX Series Tractors were placed on a 6-post accelerated design verification test to shake and simulate the worst-case vibrations that could occur during field and transport. While designing the 9RX Series Tractors, Willett said Deere engineers were intently focused on improving ride quality and operator comfort. According to the engineer, one of the tractor’s most innovative features is its parallel plane four-bar-linkage cab suspension. “This suspension provides the smoothest ride in the industry for a track tractor and isolates the operator from unwanted bumps and vibrations while reducing operator fatigue,” Willett explained. The 9RX Series Tractors also leveraged a proven sealed-cartridge and mid-roller design used on John Deere 2-Track Tractors for 20 years. “It’s a large, reliable undercarriage that supplies outstanding traction in tough field conditions,” Willett said. Regardless of whether a customer requires wheels, two tracks or four tracks, Willett said Deere offers many industry-leading tractor features, including the CommandViewTM III cab, Generation 4 CommandCenterTM controls, integrated technologies and the smooth-shifting and quick response of the e18 transmission with Efficiency Manager – designed to help save fuel without compromising performance. All awards are posted on the museum’s website at www.good-designawards.com.